It may be helpful for you to consider the introduction to Shakespeare and Modern Culture in the context of the brief descriptions of various kinds of literary theory we discussed on Friday. Which ones does the author seem to be using? 1.) 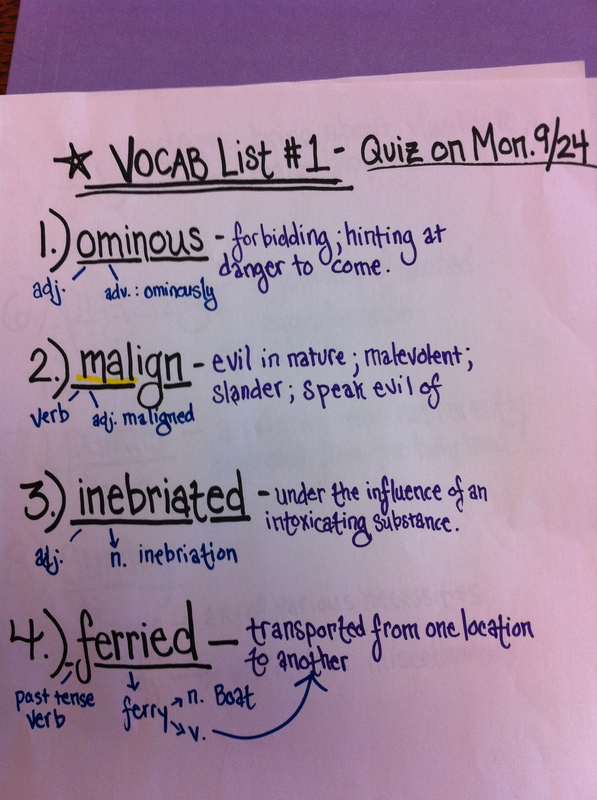 Vocabulary quiz on Monday; Career Narrative due on Wednesday. 2.) Please see Moodle if you need the Canterbury Tales homework due on Monday; note that 4th period’s assignment is different than 8th & 9th period’s assignment (you’ll all do the same work this week, just in a slightly different order). 3.) You should be filling out your very brief chivalry journal entries each day! Your journal and 1-2 page reflection are both due on Thursday. 4.) As always, your AoW is due on Friday. This week’s article was tweeted on Friday, but I do have hard copies available for you if you want to pick one up. 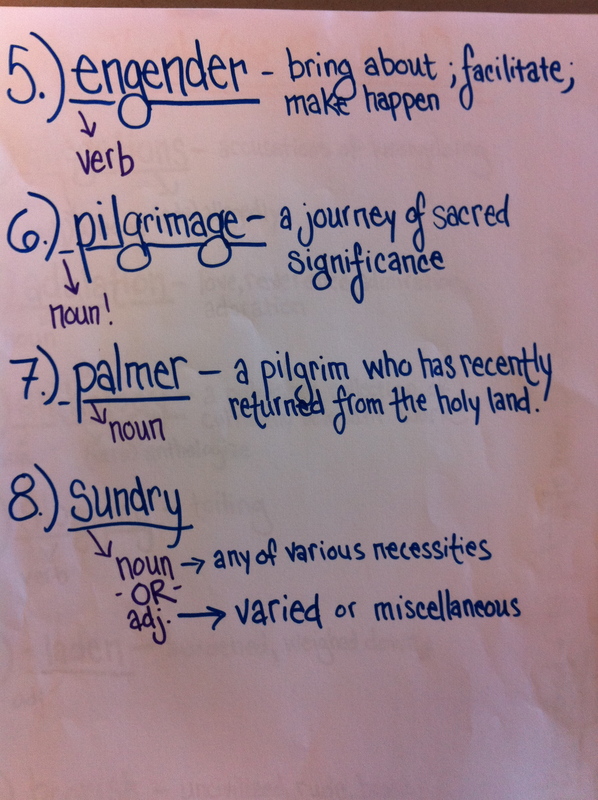 I realize this may look a bit wacky, but here are the vocab words from Friday and today in case you missed any of them. The quiz will be on Monday, September 24th. English IV and AP are at different points in the writing process, but the end goal is this: on FRIDAY of this week, ALL seniors will hand in a TYPED, DOUBLE-SPACED essay of 250-500 words (usually about 2 pages) based on your choice of the Common App prompts (I’ve posted them word-for-word below in case you need to see them again). 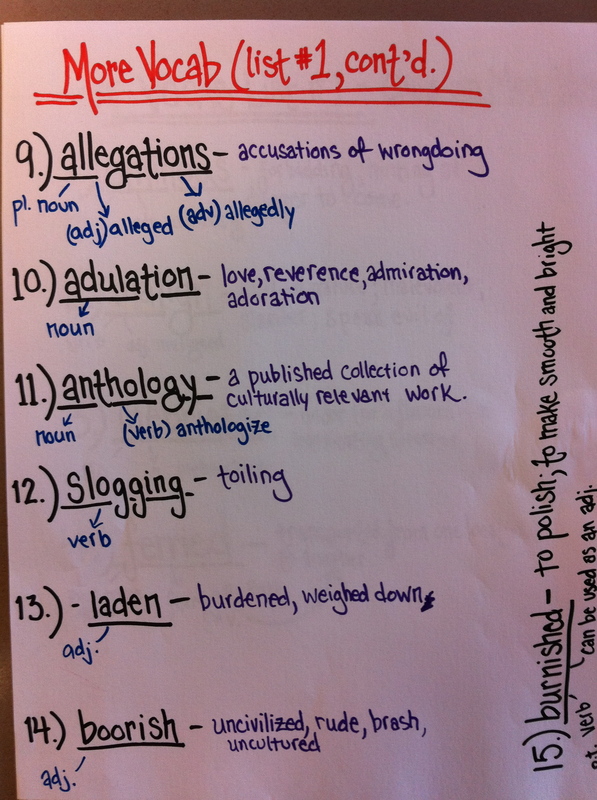 English IV, this will be your FIRST of TWO drafts. The first is worth 20 points and the second is worth 40. AP, while you’re of course encouraged to write multiple drafts of your essay, you only need to turn in ONE. It’s worth 30 points.  1.) Evaluate a significant experience, achievement, risk you have taken, or ethical dilemma you have faced and its impact on you.   2.) Discuss some issue of personal, local, national, or international concern and its importance to you.   3.) Indicate a person who has had a significant influence on you, and describe that influence.   4.) Describe a character in fiction, a historical figure, or a creative work (as in art, music, science, etc.) that has had an influence on you, and explain that influence.   5.) A range of academic interests, personal perspectives, and life experiences adds much to the educational mix. Given your personal background, describe an experience that illustrates what you would bring to the diversity in a college community or an encounter that demonstrated the importance of diversity to you.   6.) Topic of your choice. Please write an essay of 250 – 500 words on a topic of your choice or on one of the options listed [above], and attach it to your application before submission. Please indicate your topic by checking the appropriate box. This personal essay helps us become acquainted with you as a person and student, apart from courses,grades, test scores, and other objective data. It will also demonstrate your ability to organize your thoughts and express yourself. NOTE: Your Common Application essay should be the same for all colleges. Do not customize it in any way for individual colleges. Colleges that want customized essay responses will ask for them on a supplement form. I’ve gotten the independent reading information posted for English IV students (click on the tab above that says “Independent Reading”), and am now working on a brief post regarding assignments due Friday and Monday. Thanks for your patience — I’ll have them up in a jiffy (why does no one use that word anymore?). All four of these books relate in some way to September 11, 2001 — however, the events of that day are not the sole focus of any of them. The first three are distinctly about life After That Day, the fourth takes place decades before 2001 while the twin towers were still new to the Manhattan skyline and a man was boldly attempting to walk across a tightrope in between them. 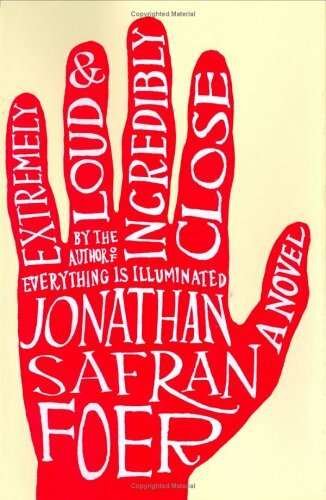 Extremely Loud and Incredibly Close by Jonathan Safran Foer is narrated by a young boy whose father died when the World Trade Center towers collapsed. His unique voice is both childlike and profound as he treks around New York City in a broad search for anyone who may have information about a key and a name he found in his father’s closet. Supporting characters such as an elderly neighbor, the protagonist’s grandmother and her “imaginary friend”, all add richness to this story. It’s painful to read at times because the little boy is blatantly searching for help from adults, but the kind of help he seeks is seemingly nowhere to be found. It’s a uniquely written book, though, that is well worth a read if you don’t mind a writer who takes some drastic liberties with punctuation to help develop a narrator’s voice. 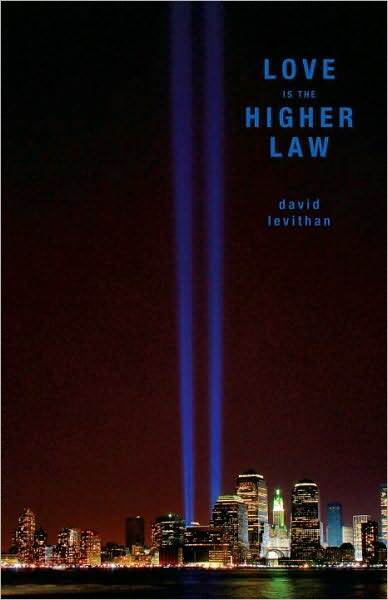 Love is the Higher Law is a brief young adult novel by David Levithan that weaves a story among three NYC teens whose lives were drastically changed when their first week of school was interrupted by planes flying into nearby buildings. While most of the story centers around other aspects of their lives, the shared experience of being on the cusp between childhood and adulthood when they witnessed firsthand the buildings burning and falling is one of their strongest bonds. This quick read isn’t the strongest writing I’ve seen from this author, but it is nonetheless a book I enjoyed reading and confidently recommend to my students. Gwen Cooper’s memoir entitled Homer’s Odyssey changes gears a little. 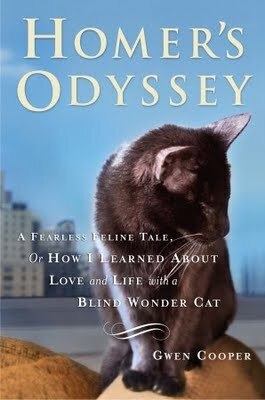 This is a nonfiction story about her experience of raising and loving a cat who was born without eyes. She was living in Manhattan on 9/11/01; one of the most traumatizing things for her was being unable to get back to her apartment for several days while Homer was alone, hungry, and terrified by all of the strange sounds and smells that had taken over the neighborhood. This part of the story takes up a mere chapter of the book, but it manages to capture a poignant and detailed account of how a person’s (and a pet’s) life was affected and how it has gone on. 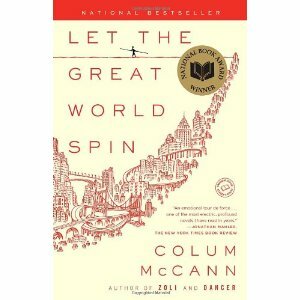 Of these four books, Colum McCann’s Let the Great World Spin is undoubtedly the most beautifully written. It fascinated me while reading to know that this book was written years after the towers collapsed, but so eloquently uses the towers as an architectural pivot point for several stories that seem completely separate until about three quarters of the way through the novel when even the most obscure details turn out to bind the individual narratives together. I can’t do it justice while leaving enough time to finish grading your essays and quizzes tonight, so please go here if you want to read an adequate review.